Dad went to the DMV bureau in a smaller town 20 minutes from his home. Parking was easy; they were nice. He had a habit of keeping his wallet (with driver’s license) hidden in the trunk of his car. As he began the renewal process he realized he didn’t have his soon-to-expire license and told the DMV person it was in the trunk of his car–he’d get it. No problem–the computer could access data. He only needed proof of who he was. Fact: Some older drivers (and others) drive under “ify” circumstances. Fact: When it’s threatening to life and limb, prevention is key. Fact: Parents resent being forced to do something, just as we would resent our children forcing us to do something. Fact: The entities and agencies, you would expect help from, may be of little or no help. Parents who drive dangerously must be stopped, but how--without straining family relationships? If you’re an only child, it’s your burden. If there are siblings and the majority agree, you can say “we’re worried about your driving and while it hurts to tell you this, the majority of us think your driving at this point is dangerous so we need your help to think about options.” If this presents problems, see #4 below. #1. What seems like a major problem, may be easily solved (could be medications). Remind “with-it” parents of this. Including them in pondering the problem and acknowledging the problem may be easily solved, is respectful, empowering, and helps them buy into whatever may come. To rule out serious problems, with your parents agreeing and perhaps making the call, consult the primary care doctor, which may lead to testing (eg. vision, neurological) or medication changes. #2. If it’s not correctable, the doctor is in a good position to deliver the message. This is a huge loss, a chunk of life is being removed. Doctors have practice in delivering bad news and hopefully do it in a skillful way. #3. Many adult children have phoned police, insurance companies, DMV etc., in efforts to curtail parents’ driving. The results vary. It’s sneaky, which is disrespectful and undermines self-esteem among other things. Understandably children usually don’t feel good about it. Only as a last resort, it may have merit. #4. If we must deliver the stop-driving message, how do we give facts, affirm our parents’ ability to participate in the decision-making and arrive at a no-more-driving result? If we’re uncomfortable attempting this and have watched AARP’s we-need-to-talk link’s video in Saturday’s post, a social worker experienced with the elderly can be a big help. Contact a local family counseling agency or an agency with social workers specializing in geriatrics. They’ve no doubt helped countless aging parents and their adult children resolve the driving dilemma. 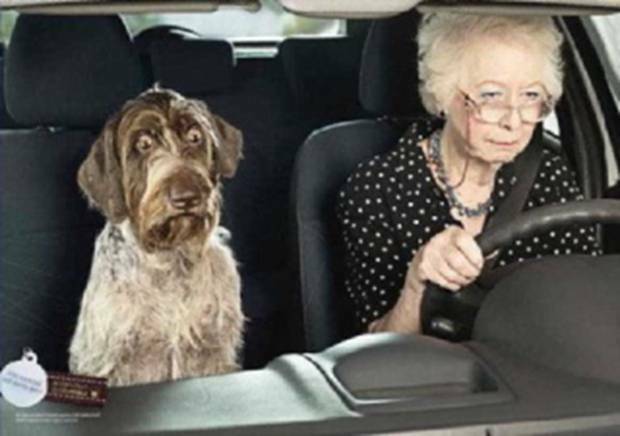 This entry was posted in Aging, Aging parents, Driving and tagged Aging parents, dangerous-driving seniors, dog and driver, elderly driver's license renewal, stop=driving conversation. Bookmark the permalink.